Dermal Therapy™ Hand Balm for very dry skin contains 10% Urea in a rich moisturising base to treat very dry hands. Dermal Therapy Hand Balm for very dry skin contains 10% Urea in a rich moisturising base to care for very dry hands. This nourishing formulation has been developed in conjunction with dermatologists to soothe itchy, irritated skin while protecting your hands from the damaging agents that can cause excessive moisture loss. The formula has been fortified with Vitamin E to replenish your skin from the first application. Unlike other moisturisers, it is richly formulated, so a little goes a long way! Massage a small amount into hands two to three times a day or as required. In a controlled 14 day trial , subjects were tested on an effected site area, using a control cream and a 10% Urea cream twice daily. This test was conducted to see if there was any increase of skin hydration between the two test products over the 14 day period. Results indicated that after the 14 day trial the 10% Urea Cream outperformed the control cream. The 10% Urea Cream was clinically proven to increase skin hydration by 45% in 14 days. In a controlled 14 day trial , 48 nurses in the UK with dry hands were tested on using Dermal Therapy Hand Balm twice daily. 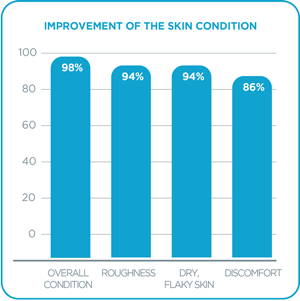 This test was conducted to see if there was any increase of skin moisture levels and if there was a reduction in dermatological symptoms on their hands after a 14 day period. Results indicated that after the 14 day trial all 48 nurses that were tested on with dry hands found that, Dermal Therapy Hand Balm significantly increased hand moisture levels and reduced the dermatological symptoms associated with severely dry hands.